In Mary Roberts Rinehart's The Bat (a book based on the play which was a collaboration between Avery Hopwood and Rinehart--see note below), Cornelia Van Gorder, a spinster who has longed for adventure, takes herself, her Irish maid Lizzie, and her neice Dale off to the country to escape the city's summer heat. She rents a country home that has recently become available when Courtleigh Fleming, a local bank manager, died. She's bemoaning her quiet, unadventurous existence when suddenly the countryside becomes the center for some very mysterious activity. Cornelia begins receiving anonymous notes meant to frighten her away from the house. There are rumors that The Bat, a notorious criminal mastermind, is in the area. And...in the wake of the bank manager's death, it is discovered that a large amount of bank funds are missing--as well as one of the bank clerks. Cornelia's neice begins acting strangely, her maid Lizzie is nervous as a cat, and her butler Billy is inscrutable (as all Chinese men of the time are represented). Dale brings home a new gardener who isn't what he seems and Cornelia decides to request that a detective be sent to help her get to the bottom of the nasty notes. Who on earth could possibly care if she spends her summer in the banker's abandoned house? That's when the excitement begins. There are mysterious people popping in and out of rooms. Strangers on the roof and bats flying through the rooms. The detective seems ready to round up and use the rubber hose on anyone who even looks at him cross-eyed. Billy the butler scurries around seeing ghosts and Lizzie is screaming at the drop of a hat. Before long, the banker's nephew is dead, a secret room is discovered, and the missing money is found. Cornelia gets her adventure....and even gets the satisfaction of outwitting The Bat. Great fun. 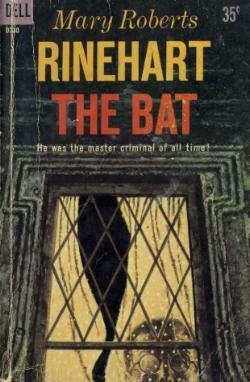 This book (which is based on the play The Bat, which in turn was based on Rinehart's The Circular Staircase) reads like a serial story. Just about every chapter ends in a cliff-hanger moment and there is more action going on in this old house than you'd believe. Four stars. Columnists took him up, played with the name and the terror, used the name and the terror as a starting point from which to exhibit their own particular opinions on everything and anything. Ministers mentioned him in sermons; cranks wrote fanatic letters denouncing him as one of the seven-headed beasts of the Apocalypse and a forerunner of the end of the world; a popular revue put on a special Bat number wherein eighteen beautiful chorus girls appeared masked and black-winged in costumes of Brazilian bat fur; there were Bat club sandwiches, Bat cigarettes, and a new shade of hosiery called simply and succinctly Bat. He became a fad - a catchword - a national figure. And yet - he was walking Death - cold - remorseless. But Death itself had become a toy of publicity in these days of limelight and jazz. The situation's this: for the first time the super-crook - the super-crook of fiction - the kind that never makes a mistake - has come to life - real life. "Sally doesn't remember when she was a younger generation herself," thought Miss Cornelia. "But I do - and if we didn't have automobiles, we had buggies - and youth doesn't change its ways just because it has cut its hair." "Every man leads a double life and some more than that," Lizzie observed. "I guess it rests them, like it does me to take off my corset." "You won't change your mind?" he asked anew. (Dr. Wells) Miss Van Gorder's smile was obdurate. "I have a great deal of mind," she said. "It takes a long time to change it." Then, having exercised her feminine privilege of the last word, she sailed out of the room, still smiling, and closed the door behind her. In her mind she was already beseeching her patron saint that she would not have to show the gentleman to his room. Her ideas of detectives were entirely drawn from sensational magazines and her private opinion was that Anderson might have anything in his pocket from a set of terrifying false whiskers to a bomb! Miss Cornelia moved over to her niece protectingly. She put a hand on Dale's shoulder to reassure her. But Dale was quite composed now - she had gone through so many shocks already that one more or less seemed to make very little difference to her overwearied nerves. "My dear child," said the indomitable lady, with a sharp glance at Bailey's bewildered face, "I have employed many gardeners in my time and never before had one who manicured his fingernails, wore silk socks, and regarded baldness as a plant instead of a calamity." "I wish somebody would knock me on the head! I'd like to forget a few things!" moaned Lizzie, but the interruption went unregarded. A brave man may be willing to fight with odds a hundred to one - but only a fool will rush on certain death. Does the story have supernatural in it or is it based on in reality? Is it a mystery? Clarissa: It's a mystery. No real supernatural qualities--just the servants thinking there are things going bump in the night. The Bat is a real criminal--murderous and a burglar. I love this book so frickin much. It actually started with the movie version for me though. I picked up this movie with Vincent Price and Agnes Moorehead a few years ago and fell in love with it, I watch it all the time. It wasn't until last year that I read Yvette's review The Circular Staircase, which sounded an awful lot like the movie that I realized their was a connection. I then found out the movie was based of The Bat and I had to get it. If you havne't seen the movie you really should.